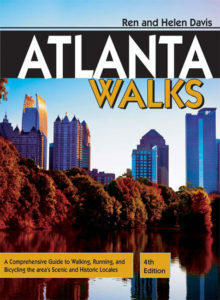 Atlanta Walks, 4th Edition – Peachtree Publishing Company Inc.
Atlanta’s moderate climate, gentle terrain, and fascinating history and architecture provide the perfect setting for delightful walks. Ren Davis holds degrees from Emory University and Tulane University. He has written articles for the Atlanta Journal-Constitution, Georgia Journal, Atlanta Magazine, and Tennis and is also a consultant in health policy and bioethics. He lives in Georgia. You can visit his website here. Helen Davis holds degrees from Ohio State University and Georgia State University. She has taught in the Atlanta public schools since 1980. She lives in Georgia. You can visit website her here.